Achieve the best outcomes with expert, practical, highly visual guidance! 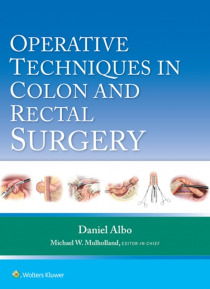 Operative Techniques in Colon and Rectal Surgery features just the colorectal surgery content from Operative Techniques in Surgery, the comprehensive 2-volume set edited by Michael W. Mulholland, MD, PhD. Ideal for practitioners who wish to focus on mastering today's best colorectal surgery procedures, it takes you step-by-s… tep through each technique in a consistent manner, using concise, bulleted text, full-color illustrations, and full-color intraoperative photographs to clearly convey exactly what to look for and how to proceed.